4th of July Fun in Prince William County! 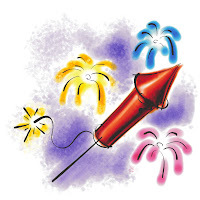 Not on the 4th Fireworks (Tim’s Rivershore- 1510 Cherry Hill Road Dumfries VA): On June 29th, Tim’s will host their annual “Not on the 4th” fireworks show. Fireworks are launched from a barge on the river, and Tim’s recommends coming early for a seat in the restaurant. Dale City Independence Day Parade (Dale Blvd from Keytone to Gemini): Dale City’s annual parade always gets under way at 10am. This LONG parade features local scouts, businesses, fire trucks, floats, and more, and ends in the commuter parking lot behind the Comcast building (think Dale City Farmer’s Market) with a fun fair. Bring cash to purchase drinks/snacks and line up early to get a good seat along the parade route, which follows the side of Dale Blvd. heading towards I-95, closing traffic to one lane each direction on the opposite side. 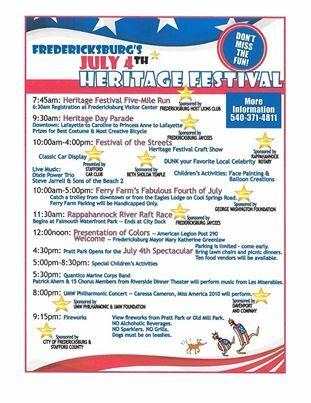 City of Manassas (Harris Pavilion 9116 Center Street, Manassas VA): The City of Manassas celebrates the 4th of July with an Independence Day party with live music, rides, an Apple Pie Baking Contest, carnival foods, face painting, and a red, white, and blue hayride. Events kick off at 4pm, and fireworks are scheduled for 9:15. Rain date is July 5. Activities and food prices vary, no admission fee or fireworks charge. out at the gate. People do come out and sit around the exterior of the stadium to watch the fireworks- but plan to pay to park if you drive up to the stadium, and for it to be CROWDED getting out! Signal Hill Park (9300 Signal View Dr. Manassas Park VA): Thursday, July 4th from 7-10pm, free admission, shuttle service from VRE and City Hall, $5 on-site parking handicap only, limited general parking across the street. Great Meadow Foundation (5089 Old Tavern Road, The Plains VA): Great Meadow Foundation’s festivities. General Admission is $40 per car at the gate or $35 in advance. Included in admission, which begins at 4pm, is rock wall, laser tag, moon bounces, bands, and a rain machine. There will also be helicopter performances, polo demonstrations, and one of the area’s largest fireworks exhibitions. Pony rides are available for $5, and there will also be food available for purchase if you prefer not to tailgate. This location is about 11 miles from Haymarket and 46 miles (an hour) from Woodbridge. 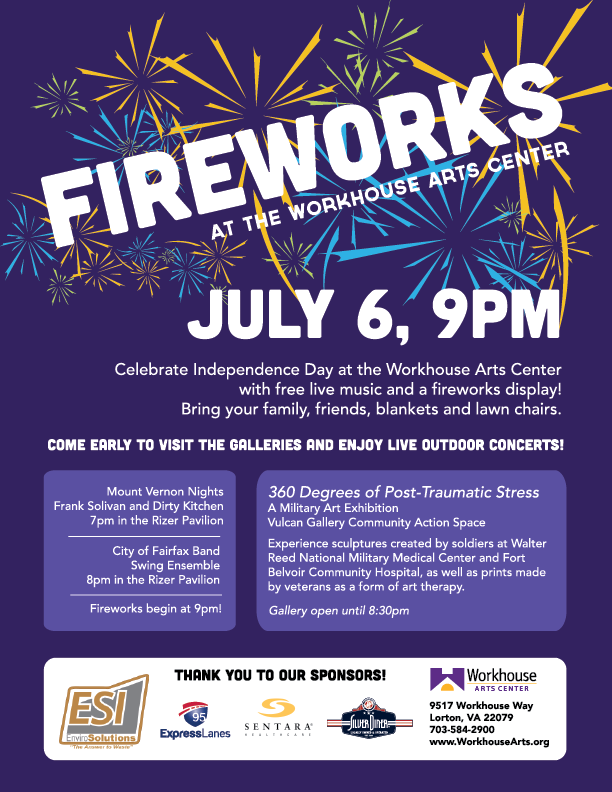 Lorton Workhouse (9601 Ox Road, Lorton VA): Will present a patriotic concert and fireworks on July 6th, with the concert beginning at 7pm and fireworks commencing at 9pm. Both events are free, but you’ll want to bring a blanket or lawn chairs, and plan to leave outside alcohol at home. The Workhouse is on the opposite side of the Occoquan Bridge, 3 miles from Woodbridge, or 23 miles (about 30 minutes) from Bristow. concert, and Stars and Stripes Barbeque. Anytime activities are outside, they can change with the weather, so please use common sense or call before heading out! These are just events presented, not endorsements, although we love to hear reviews, so send us yours! We’re happy to link to your business or blog. Also, if we’re missing something, let us know!